In Naples there are many tombs of famous people. Tombs that attract millions of people from all over the world, every day and every year. Foscolo, in the “Sepolcri”, described the “grave” as a place of comfort for the living. In a tomb lies the hope that after death a man can be remembered thanks to the love of his family. Who was famous in his life, as a poet, an actor or a scientist, after death could be remembered also for his grave that has become a pilgrimage place for his followers. Many illustrious men lie in the cemetery of the city in a special area called the square of the illustrious men. Here lie the remains of Benedetto Croce, philosopher, critic and man of great culture, Francesco De Sanctis, one of the most important critics of literature of the nineteenth century and Luigi Settembrini, critic and professor of literature at the Federico II university. 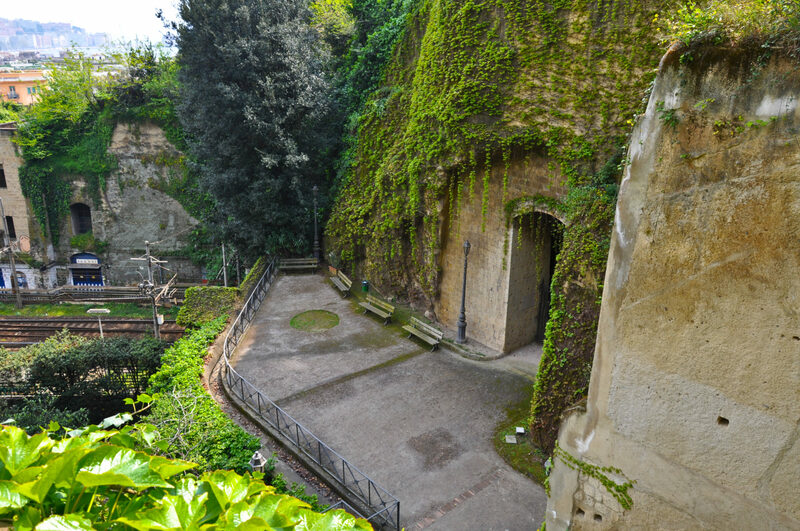 In the popular area of Piedigrotta, known for festivals and popular celebrations, there is a park that hides the tombs of two important poets. The Vergiliano park, not to be confused with the Virgiliano park situated in Posillipo, preserves the tombs of Giacomo Leopardi and Virgilio. Giacomo Leopardi in fact lived the last period of his life in Naples, exactly at the foot of Vesuvius, and at first he was buried in the church of S. Vitale, then before the second world war the city decided to move it into the park, close to Virgilio’s cenotaph. In fact like Leopardi, Virgilio lived the last years of his life in Naples, but here we have just the cenotaph, that is an “empty tomb”, or a monument erected in honour of a person or group of people whose remains are elsewhere. Last but not least, here in Naples, in his city, lie the remains of Antonio De Curtis, better known as Totò or the ” prince of laugh”, comic actor, poet, one of the most important figures in the Neapolitan and Italian show business, known all over the world. If you want a different trip, not just museums and churches, come to Naples and visit its tombs…and if you are brave, visit them during the night!